Given with a valuable gift invested toward their education, pupils of Tinajeros Elementary School (TES) are sure to have fun reading and learning in their newly opened “Edutainment Center”. This education and entertainment hub is a gift given to the pupils by Cherry Mobile and other sponsors as part of the nationwide Brigada Eskwela program held on May 20-25, 2013. TES used to maintain an old library which the students do not even take time to visit because it is not conducive for studying. The break came when Acts of Hope for the Nation (AHON) Foundation, Inc, a non-profit organization that builds fully functional libraries by donating thousands of reference books to public elementary schools, decided to donate books worth P500, 000 to the school with only one condition: that they will be able to provide a good library in which to house the new books. Cherry Mobile helped TES take the challenge for the benefit of the students by providing the materials needed to create a student-friendly library out of an old classroom. Now, the library is inaugurated and known to the pupils as the “Edutainment Center” which consists of a reading area for toddlers, a tutorial section, a counter for the school librarian, and space for the computer section. The fun colors of the walls, chairs, and cabinets as well as the sky blue ceiling are intended to stimulate learning and creativity among the pupils, as the center is designed to be an interactive venue for educational and entertaining activities. 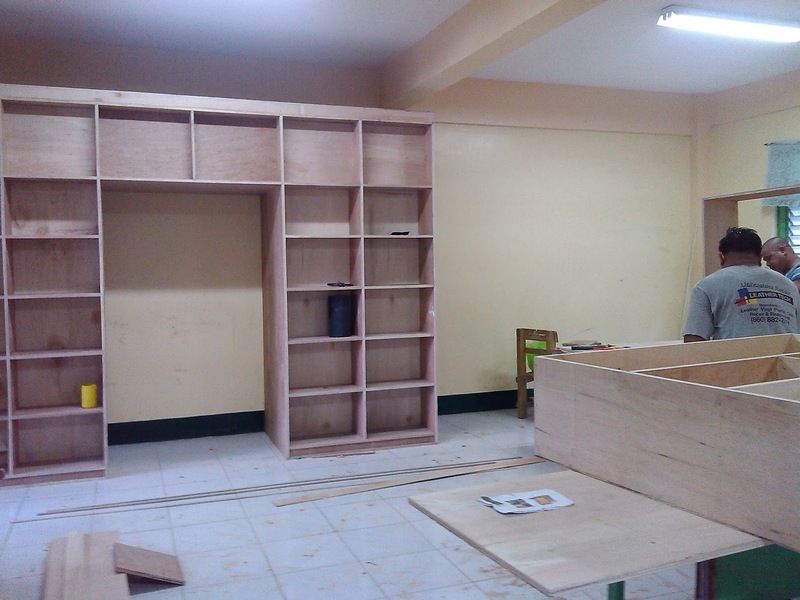 This is what the library initially looked like during the construction of the cabinets that would hold the books donated to TES. The cabinets and bookshelves were sufficiently constructed to hold books of different shapes and sizes for readers ranging from toddlers to soon-to-be-highschoolers. TES intentionally designed its library to be colourful to stimulate reading and creativity among the students, imbibing the mindset that learning can be fun. Cherry Mobile provided the library with a counter for the librarian to administer discipline among the pupil readers. With the new edutainment center the school aims to improve the reading ability of its students and make it a part of their lives, as it ingrains in the mindset of the children that, indeed, learning can be fun. Cherry Mobile sees this as a worthwhile investment on the education sector because a library which pupils can actually use is a big factor on the development of the education both in the primary and secondary levels. Many public schools lack good libraries due to insufficient budget, and these are schools that Cherry Mobile continuously desires to reach out and invest on. Present during the inauguration of the TES Edutainment Center were (seated from left to right): Principal Zenaida Roberto, Barangay Captain Esteban Arevalo, Officiating Minister Dr Pio Tica, Malabon Mayor Antolin Oreta III, AHON Foundation Executive Director Harvey Keh, and Cherry Mobile CSR Manager Leah Esperanza Lopez.